Sadly, my laptop has been sick this week. This creates a dilemma that I’m sure everyone has faced: the joy of shopping mixed with the annoyance of spending hard-earned cash. Plus, I’ll have the annoyance of transferring everything over. I suppose it’s like all the construction in Kent – annoying for now, but wonderful when it’s done. And at least it’s happening before school starts. At any rate, one result is that I’m terribly behind when it comes to posting on the blog. So here come a few images and descriptions from the week. First, we finally got to eat the Ohio City Pasta spinach ravioli that we picked up a few weeks back. I made a quick marinara sauce with all our tomatoes, garlic, and basil. 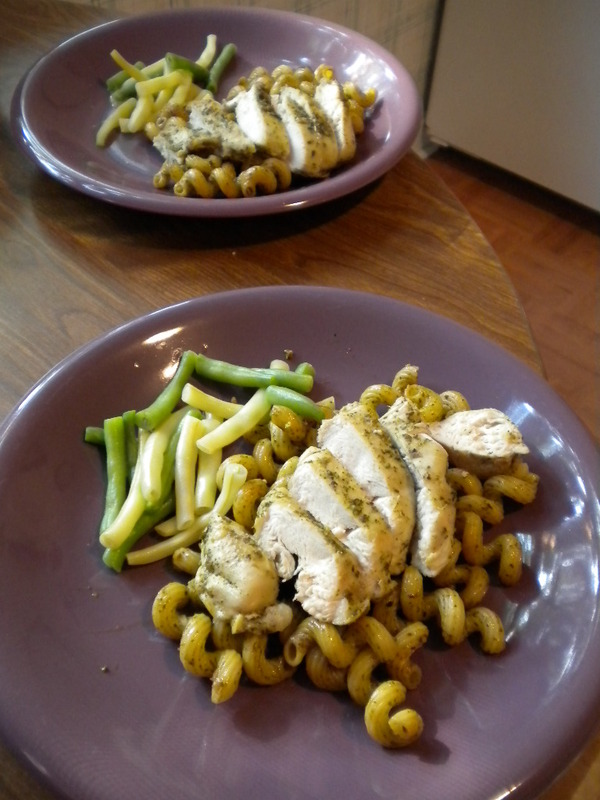 Then last night I made pesto chicken. Between Matt’s basil and our own basil plants we’re going to be eating lots of basil for the next few weeks! I fried the chicken with lots of pesto, some onion and garlic, and a bit of butter and served it with the beans (no picture from last night, I’m afraid). But my efficient moment of the week was to boil some cavatappi at the same time. That allowed me to deglaze the pan with chicken broth and toss in the pasta to soak up all of the flavors from the chicken. Then tonight’s dinner was simply a matter of reheating the leftover chicken along with the pre-made pasta and refreshing it all with a bit of fresh basil. Boiling the last of our green beans only took a few minutes. So no fuss tonight, but it looked and tasted like I had spent an hour in the kitchen. 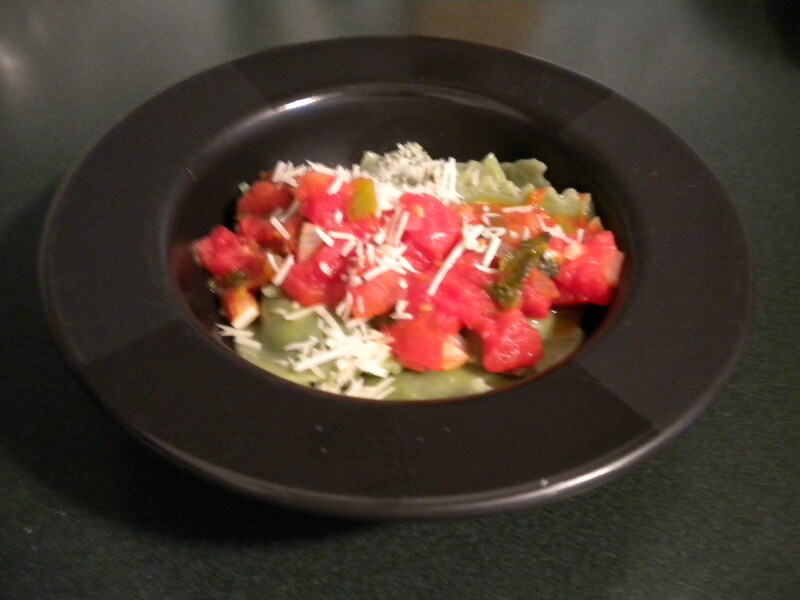 This entry was posted in Dinner, Pesto on August 5, 2011 by theneighborboys. That pasta looks wonderful with the pesto! I will try that. And sorry about your laptop, and thanks so much for the children’s books. That meant the world to me! It was yummy pasta! I’m such a pesto/basil freak! You’re so welcome for the books. There is something remarkably exciting and depressing about shopping for a computer. Care and I have been discussing pesto as we, for a change this year, have a lot of basil. Is it something about the weather that made them grow so much? We only planted one mature plant and we have toooons of it too. The pesto looks amazing!! Today is my pesto day. Hoping it turns out well! Where do you get that pasta? I’d like to try some. Cat – it’s just whatever brand I can find at Giant Eagle any given week. The shape is cavatappi (Or should there be two Ts and only one P? Hmm. At any rate, my spelling is close.) It’s a great shape to serve with a strongly flavored sauce and one of our favorites lately. How was the spinach ravioli? It looks wonderful. I love pesto, but sadly my basil did not do well. I have TONS of thyme. Any ideas for that? The ravioli was great. I don’t think we’d have liked the spinach ravioli without the marinara sauce would be my only comment. Jeff picked up a new flavor at the market today. I always love thyme with acid – so lemon chicken with thyme, for example. Or the same idea with rice, or green beans with butter, lemon, and thyme. Now I’m craving thyme (as well as craving more time to cook)! I never thought of putting thyme with rice, but I will try that. Rice is one of Bob’s favorites. Thanks!